The Minoans lived on the Greek islands and built a huge palace on the island of Crete. The Mycenaeans lived mostly on mainland Greece. The Minoan civilization began to weaken around 1450 BC. Archaeologists think this might have been due to a volcano that erupted and caused an earthquake and tidal wave that damaged Crete and left toxic ash on the crops. The Mycenaeans were able to take over the islands from the weakened Minoans and adopted much of the Minoan culture. The Trojan war was between the Greeks and the Trojans. It all started when the prince of Troy, Paris, took Helen the wife of Menelaus who was from Sparta. The Greeks were mad so they went to get her back and they fought and finally won when they sneakily hid inside of a horse they gave to the Trojans and set up a surprise attack. A very famous person in who was killed in this war was Achilles. The Mycenaean civilization collapsed at the end of the second millennium and it is thought that the Dorian civilization came and attacked them. They came from the north and destroyed all the villages and everything in their path. The Dorians were very warlike and had superior metal weapons. The Dorians did not have a written language so we do not know very much about them. They had a 400 year rule in Greece called the dark ages. 743 B.C. - 600 B.C. 492 B.C. - 490 B.C. After the Ionian Revolt of 499 BC, king Darius and Persia wanted to take over Greece because the Greeks helped the Ionians to revolt and they wanted more land. They wanted to attack Athens and they went by sea. Athens won the battle even though they had the smaller army. The Athenians won the war. After their defeat at the Battle of Marathon, the Persians, led by King Xeres, the son of Darius I, mounted a second invasion of Greece around 480 BC seeking revenge. The Greeks, led by the Spartan King Leonidas I and 300 Spartans, met the Persians at a narrow pass in the mountains called Thermopylae. The Greeks held off the Persians for 7 days until the Persians found a way around the mountains and got behind the Greeks. and annihilated them. The Persian army then went to Athens and burned it. The Athenian fleet, was waiting for the Persians by the island of Salamis. The Athenian ships, called triremes, were fast and maneuverable. They rammed into the sides of the large Persian ships and sunk them. They defeated the Persians and Xerxes went back to Persia leaving his general Mardonius to finish the conquest. 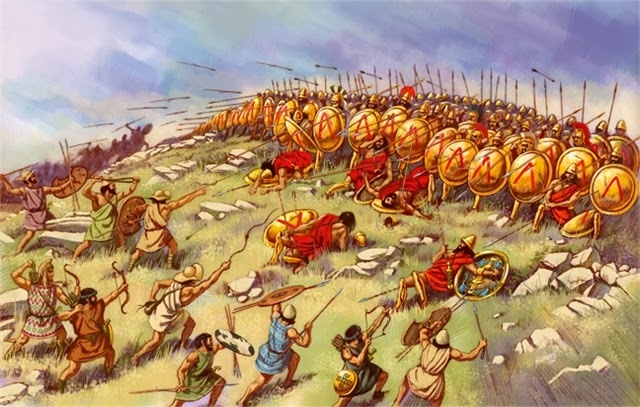 The following spring, the Greeks assembled the largest army ever and attacked Mardonius at the Battle of Plataea. The Greeks won and killed Mardonius. On the same day, across the Aegean Sea, the Greek navy defeated the Persian navy at the Battle of Mycale. With this double defeat, the invasion was ended, and the Greeks expelled the Persians from Europe, the Aegean islands and Ionia before the war finally came to an end in 479 BC. The war was between Athens and Sparta. Athens was gaining so much power and that alarmed Sparta and its allies so they attacked Athens. The result was Sparta winning and Athens loosing some of their power. 379 B.C. - 371 B.C. After Athens lost some power in the Peloponessian war Sparta was at the top, power wise, and Sparta tried to impose dominance over the rest of Greece. The war(s) were battles between Thebes and Sparta for control over Greece. In the end, at the battle of Leuctra Thebes won the war and was the most powerful state in Greece. Alexander the Great became the King of Macedonia in 336 BC and he wanted to rule the world. In 335 BC he conquered Thebes and took control over Greece. He decided to invade the Persian Empire. Alexander defeated the Persian King Darius III and then moved into Egypt to take over Persia's navy bases and expand his growing empire. He was very successful in spreading Greek-influenced culture to most of the known world which lasted for several centuries after his death. His conquest of Egypt and Persia gave everyone a common language and currency and greatly improved trade routes between the east and west. This allowed allowed people across the empire to share their cultures and religions. Alexander 's reign was not very long, but the long-term impact that he had on eastern and western cultures was tremendous.